Edit Header to insert or edit the header text. Edit Footer to insert or edit the footer text. Set the Position of text relative to the top (for headers) or bottom (for footers) of the page. Check the Different first page box to apply a different header or footer to the very first page or in case you don't want to add any header/ footer to it at all. Use the Different odd and even pages box to add different headers/footer for odd and even pages. The Link to Previous option is available in case you've previously added sections into your document. If not, it will be grayed out. Moreover, this option is also unavailable for the very first section (i.e. when a header or footer that belongs to the first section is selected). By default, this box is checked, so that the same headers/footers are applied to all the sections. If you select a header or footer area, you will see that the area is marked with the Same as Previous label. Uncheck the Link to Previous box to use different headers/footers for each section of the document. The Same as Previous label will no longer be displayed. To enter a text or edit the already entered text and adjust the header or footer settings, you can also double-click within the upper or lower part of a page or click with the right mouse button there and select the only menu option - Edit Header or Edit Footer. 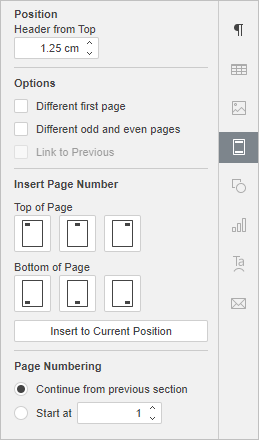 To switch to the document body, double-click within the working area. The text you use as a header or footer will be displayed in gray. Note: please refer to the Insert page numbers section to learn how to add page numbers to your document.